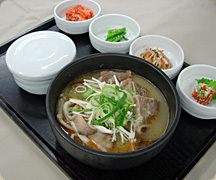 - Namul. Assorted side dishes. - Soup of the house. - Dak bokum. 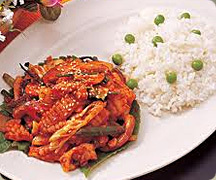 Pan fried chicken with special Arirang sauce. - Prawn tempura. Deep fried prawn and vegetables with special tempura sauce. - Beef bulgogi, barbeque cooked on the table. - Jap chae. Glass noodles with beef and vegetables. - Beef bulgalbi, spare ribs barbeque cooked on the table. - Bin dae tuk. 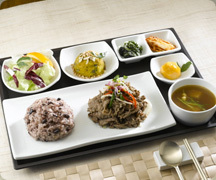 Traditional Korean pancakes with pork and vegetables. - Beef bulgalbgi, spare ribs barbeque cooked on the table.